A woman struggles to survive in the besieged city of Madrid during the Spanish Civil War. It’s 1940 and María lives anonymously in the city which, despite what our history books tell us, has held out for four years and, with American help, may see its long siege lifted. A chance meeting with her son, a soldier in the army of General Franco, in the ruins of the city university will take her from the bombed streets of Madrid to the old Moorish city of Granada. Besieged by the Republican forces, it’s the key to defeating Franco. Its Alhambra Palace in ruins, can she, the awkward Captain Gregorio and a group of Andalusian anarchists uncover the secret Lorca left behind shortly before his own execution in 1936? What I enjoyed most about this novel was Fisher’s way of inserting me into war-torn Madrid. Never for a moment did I think that he didn’t know what he was talking about. It’s obviously that Fisher is quite familiar with the city and the history. The battle scenes are realistic and the main character and supporting cast are entertaining. It’s refreshing to have a woman as the heroine in a war novel. I’m not very familiar with this part of history and I learned some things while reading Fisher’s novel. I love historical fiction since I learn but it doesn’t really feel like I’m doing homework. While I enjoyed reading this book, I do wish more care was taken during the editing process. I don’t mean typos. I can live with a few typos. However, I think some of the scenes could have been shortened and a few of the characters just disappear from the book. Granted, this novel takes place during a war and people died unexpectedly and went missing all of the time. As a reader though, I would have liked more closure. Maybe Fisher plans to continue with the story. There’s plenty to work with and this is a dynamic time period and his characters I think have much more to say and do. Given that this is his first novel, I have to say it’s a good start. And I encourage Colin Fisher to keep writing. I know I would like to read more by him and watch him hone his skills. This entry was posted in Book Reviews and tagged A Republic of Wolves. 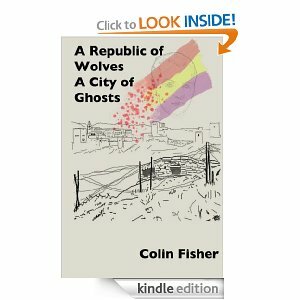 A City of Ghosts, Book Reviews, Colin Fisher, Historical Fiction, Indie Publishing, Indie Writers, Self-Publishing, Spanish Civil War. Bookmark the permalink. Nice review! Honest and truthful and supportive of the writer. You are really finding some great and varied books/writers to review—what a great thing! Thanks, Beth Ann. I’m loving the variety and it’s wonderful to get to know so many new authors. A well written review TB. I like that you are honest and yet encouraging. Thanks, Colline. I really enjoyed his book and I believe his writing will only get better. Thanks, Cindy. It’s a fun read.